There is an enormous interest in all things angelic. We are being called to work with the angels in great numbers, to bring healing, peace and love to our families and communities and our home, the Earth. Millions of gifted people are healers and Light Workers on a purposeful spiritual journey. But is there an angel within ALL of us? Many of us have a deep inner knowing that connects us to a divine consciousness. Imagine if you could connect to that ‘angel within’ that is available and willing to guide you every day. Let’s take it step by step with this simple attunement. You’ll need perhaps half an hour so switch off your phone, take a pen and paper, and find a quiet place free from distractions and, if you can, light a candle for this exercise. First take a few moments to focus inwards and breath steadily, relaxing into an internal sacred space. Do you remember the occasion when you first felt drawn to the angels? Maybe there was a definite occasion, or you may know that you have ‘always’ believed and felt a strong connection, since childhood. Note it down now. Ask yourself whether an emotional state, such as sadness or joy, brought the introduction of angels, or whether it was just a natural process? Have you had a wake-up call to embark on a spiritual path? Did it involve any of the attributes you might associate with angels, such as healing, teaching, or music perhaps? Who were the mentors and guardians that appeared? Were they in spirit, such as guides, angels, ancestors or in physical form? Do you recognize your inner demons, or reflections of your inner shadows? What steps have you taken to overcome them? This is a hard question and takes honest reflective practice. You need to step back, no fault-finding, just observe personal challenges. Now think of the people you know around you, especially those you love or admire. What are the angelic qualities you see in others? List them, and why. What are your angelic qualities? Yes you have them too! Qualities we admire in our best friends are often reflections of our own. Now we are nearly there… you are slowly turning to inwardly accept the angel within yourself. Visualize the gem that lies within your heart, reflecting the beautiful unique soul that you are. Greet your angel within with a loving embrace. Allow a warm glow to develop deep inside that spreads through your body and outwardly creates a broad smile. If you love the angels then you can love the angel inside you too. You are so full of love that it overflows! 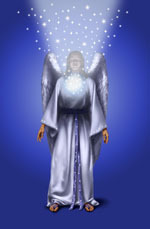 Now you are in touch with your ‘inner angel’ how does this change your perception of the world around you? Imagine that as you look out into the world that you are seeing through the eyes of an angel, that everything is positively charged with loving energy. Keep a diary of the feelings and experiences during this exercise and repeat it whenever the opportunity arises. I’ve just launched a prize draw on Facebook to win a beautiful angelic canvas. This ‘Angel Blessing’ was created by Debbie McIntee at Soulful Creations and she kindly donated it at a recent workshop. The prize draw will run through until the end of August so please visit my page and enter, and of course, visit Debbie’s site and like that too!